Beat 5 eggs in a bowl, set aside. Heat gently, stirring until sugar has dissolved. What’s a double boiler? It’s a metal pan, set over a pot of simmering water. You use this if cooking by direct heat would burn your ingredients. 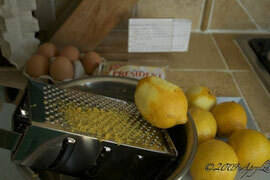 Whisk some of this hot mixture into the reserved eggs; adding gradually, so as not to curdle the eggs. After mixing the eggs thoroughly, gradually whisk this back into the double boiler. 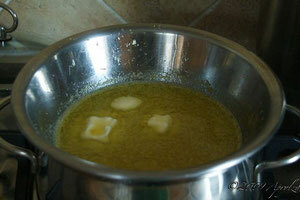 Cook over a gentle heat, stirring frequently for about ½ hour, until the mixture coats the back of a spoon. DO NOT allow it to boil, or it will curdle. Pour the curd into warm sterilized jars and seal. 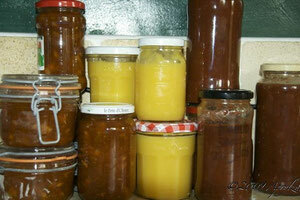 I save old jam jars, so long as the seals are still good. There are several ways to sterilize jars. I prefer to run them through a hot dishwasher. Other ways include soaking in a sterilizing tablet, as you would for baby bottles; or putting them in a 100°C oven for 20minutes. As the jars cool, you’ll know that you have a seal, if it pops and the lid is tight. If not, then mark the lid, use it immediately and discard the lid afterwards. Store cooled jars in a refrigerator or ground cellar for up to 3 months. This is wonderful on toast or as a flan filling. To answer that question (below), I don't do any additional heat processing other than hot curd into hot sterilized jars. I wouldn't want to take the chance at curdling the delightfully smooth & tangy creamy goodness. In addition, I'd assume that adding an extended period of heat would result in some flavor loss. yay this sounds great. i love lemon curd! do you seal with a hot water bath then?